Use this form for authorized personal representatives to transfer a decedent's real estate to a devisee or heir as directed by the deceased property owner's will, or according to Indiana's laws of descent and distribution. When we die, another person becomes responsible for managing the assets we leave behind. If we die testate (with a will), this person is called an executor. If we die intestate (without a will), or other specific situations occur, the court supervising the probate estate appoints an administrator. Once the executor or administrator is in place, Indiana laws identify this individual as a "personal representative." See IC 29-1-1-3(23) for the list of titles included under this role. The judge supervising the case confirms the personal representative (PR) by issuing letters testamentary or letters of administration, as appropriate. Note that the PR must apply for the letters within five months of the decedent's death (IC 29-1-7-15.1(b)). Once the letters are in place, the PR gains access to the probate estate, defined as "property transferred at the death of a decedent under the decedent's will or under IC 29-1-2, in the case of a decedent dying intestate" IC 29-1-1-3(24). One common task handled by the PR is transferring ownership of the decedent's real property. 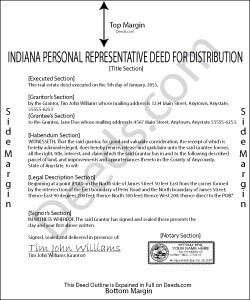 Indiana's statutes contain a form related to property distributed to a devisee or heir (IC 29-1-7.5-3.4). In addition to the statutory requirement to provide relevant facts of the probate case, personal representative's deeds must meet all state and local standards for format and content. Note that personal representative's deeds to not include warranties of title, so it makes sense for distributees or potential purchasers to consider a title search for the property. This can reveal defects in the chain of title (ownership history), and may prevent potential issues in future transactions. Depending on the circumstances, the PR might need to provide additional supporting documentation including a certified copy of the authorizing letter, death certificate, will, etc. Also, the transfer might require approval from the court or others with an interest in the estate or the property. Navigating the complexities of a probate case can be overwhelming, but taking the time to ensure a valid transfer during active probate is much easier than untangling problems later on. Please contact an attorney or probate court officer with specific questions or for complex situations. FRANK O. said: Easy to download and use the forms, however two forms needed for my county recording were not included. Reply from Staff: Thank you for your feedback Frank. We'll look into finding and including the additional supplemental documents. Sometimes supplemental documents have to be generated by the county's system, specific to the transaction. Barbara S. said: I had an issue due to the fact that I had many beneficiaries. I was and still am not sure how to handle this. We do have Adobe Pro and can modify the form, if needed. But I would like to talk to your organization for more information. Reply from Staff: While we are unable to assist you specifically with completing the document we can note that this is addressed in the guide. Information that does not fit in the available space should be included in an exhibit page. Monica D. N. said: The Web site is very intuitive, organized well and forms are easily found. The instructions provided are very helpful. Value in terms of price is very good. Roger M. said: Great package it was nice to be able to get everything required for recording this deed in one place. Reply from Staff: Thanks Roger, we appreciate your feedback.